Benjamin was born circa 1851 at Lowndes, Georgia, United States.1 He was the son of Benjamin Tompkins and Martha Hardie. He married Josephine C. Carroll, daughter of Patrick Carroll and Nancy S. Hair, on 24 December 1873 at Suwannee, Florida, United States.2 Benjamin died circa 1892 at Suwannee, Florida, United States. [S65] 1860 Census Hamilton FL, Pg. 578, Dwelling 122, Family 122, 15 Jun 1860. [S66] Suwannee Co. FL Marriage Records, Book 1, Pg. 176. Josephine was born on 16 July 1856 at Barnwell, South Carolina, United States.1 She was the daughter of Patrick Carroll and Nancy S. Hair. She married Benjamin Tompkins, son of Benjamin Tompkins and Martha Hardie, on 24 December 1873 at Suwannee, Florida, United States.2 She married Henry Solomon Thompson Sr., on 19 December 1894 at Suwannee, Florida, United States.3 Josephine died on 31 January 1940 at Perry, Taylor, Florida, United States, at age 83.4 Her body was buried on 1 February 1940 at Beulah Church Cemetery, Suwannee, Florida, United States. "MRS. THOMPSON IS CLAIMED BY DEATH"
"Mrs. Josephine Carrol Thompson, 83, of New Harmony, died Wednesday of last week, in Perry, after being struck by an automobile while attempting to cross a street. Funeral services were held Thursday afternoon at 4 o'clock at the Beulah Church with Sister Bessie of the Church of God, of Perry, in charge. Burial was in the adjoining cemetery." "Mrs. Thompson was born in Barnard (This should be Barnwell) district of South Carolina in 1856. In 1873 she was married to Richard Benjamin Tompkins (This should read Benjamin Tompkins - we have never seen the Richard name before and believe it is an error). Widowed, she married the late H. S. Thompson." "She came to this county when a child and made it her home until about 14 years ago when she moved with her husband to Perry. She was a member of the Church of God." "She is survived by six sons, Walter Tompkins, who lives near Luraville, G. W. Tompkins, Cross City, W. B. Tompkins, Madison, J. H. Tompkins, New Harmony, H. S. Thompson, Perry and C. P. Thompson, Perry and four step-daughters, Mrs. L. R. Cash and Mrs Mathew Albritton, both of New Harmony, Mrs. Ella Lee, Taylor county, and Mrs. Katie Williams, Madison county. Many grand children also survive." Children of Josephine C. Carroll and Henry Solomon Thompson Sr.
[S710] From gravestone 19 Apr 1981. [S66] Suwannee Co. FL Marriage Records, Book 2, Pg. 306. [S11] Florida State Vital Records, Cert of Death for Josephine Thompson, V.881, File 2465, 1940. [S120] "Baptismal Records Church of Latter Day Saints, Greenville, Florida Mission, Southern States", Baptism Records, Page 108. [S66] Suwannee Co. FL Marriage Records, Book 2, Pg. 521. [S67] Lafayette Co. FL Marriage Records, Book D, pg. 88. [S710] Personal communication from Larry Tompkins, 27 Mar 1989. [S269] Jessie H. Paulk and Delma W. Paulk, Dixie County Florida Cemeteries,. [S23] 1900 Census Suwannee FL, E.D. 112, Sheet 11, line 45 22 June 1900. [S710] Personal communication from Henry Thompson, Jr., 22 Apr 1981. 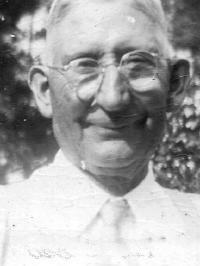 James was born on 23 July 1883 at Suwannee, Florida, United States.1 He was the son of Benjamin Tompkins and Josephine C. Carroll. He married Elizabeth Chestnut, circa 1905 at Florida, United States.2 He married Beulah Fox, circa 1910 at Florida, United States. He married Mary Rosa Leola Clemons, on 26 December 1917 at Lafayette, Florida, United States.3 James died on 19 September 1944 at age 61.1 His body was buried in September 1944 at Beulah Church Cemetery, Suwannee, Florida, United States. [S710] Personal communication from Myrtice TOMPKINS Beck, 15 Aug 1987. [S67] Lafayette Co. FL Marriage Records, Book E, pg. 303. J. was born circa 1884 at Suwannee, Florida, United States.1 He was the son of Benjamin Tompkins and Josephine C. Carroll. J. died circa 1932 at Suwannee, Florida, United States. [S38] 1885 Census Suwannee FL, Pg 143, Dwelling 418, Family 439, 30 Jun 1885. "NEWBERN RESIDENT, J. S. PARKER, DIES, AFTER LONG ILLNESS"
"J. S. Parker died at his home near here Tuesday night, after being in failing health for many years." [S34] 1860 Census Madison FL, Pg 79, Dwelling 560, Family 560, 26 Jul 1860. [S66] Suwannee Co. FL Marriage Records, Book 1, Pg. 187. [S66] Suwannee Co. FL Marriage Records, Book 7, Pg. 266. [S11] Florida State Vital Records, Cert of Death for John S. Parker, V.896, File 9607, 1940. [S23] 1900 Census Suwannee FL, E.D. 111, Sheet 19, Dwelling 357, Family 368, 20 June 1900. [S11] Florida State Vital Records, Cert. of Death for Annie Parker, Vol. 322, File No. 22319, 1926. Robert was born in January 1879 at Suwannee, Florida, United States.1 He was the son of John Stafford Parker and Anna Mercy Brannan. He married Georgia Rosetta Tison, daughter of William Jasper Tison and Mary A. Elizabeth Ammons, on 7 January 1897 at Suwannee, Florida, United States.2 Robert died on 7 November 1913 at Suwannee, Florida, United States, at age 34.3 His body was buried at Rocky Sink Church Cemetery, Suwannee, Florida, United States. Robert Franklin Parker reportedly died from complications developing from a small sore on his face which he "picked at" until it became infected, causing his death. [S35] 1880 Census Suwannee FL, E.D. 147, Dwelling 42, Family 42. [S331] James Daniel Mims and Rachel Mavis Tomlinson-Mims, Suwannee Co. FL Marriages Book 2, p.27 (Recorded Bk 2-417). [S311] Sharon Driver Wright, "Robinson Family Records." [S679] Jinnie Hancock, Suwannee FL Marriages - Book III, p. 45. [S225] Suwannee County Genealogical Society, Suwannee FL Cemeteries - Vol. 2, p. 63. [S225] Suwannee County Genealogical Society, Suwannee FL Cemeteries - Vol. 2, p. 22. Frank was a life long resident of Madison County. He and his wife Temperance raised six children. He died in 1907 at age 56 and is buried in Pine Grove Church Cemetery, Madison County, Florida next to his wife. His parents and many of his children are buried there also. [S68] Madison Co. Florida Marriage Records, Book A2, Pg. 485. [S24] Frank Hadden Bible. This bible contains the full names and dates of birth of the children of Frank Hadden and Temperance Ann Caulk of Madison County Florida. Holy Bible containing The King James and The Revised Version of Old and New Testament. [S710] Visited by writer 20 Apr 1981. Temperance was born on 15 June 1853 at Madison, Florida, United States.1 She was the daughter of James Joseph Caulk and Mary Ann Townsend. 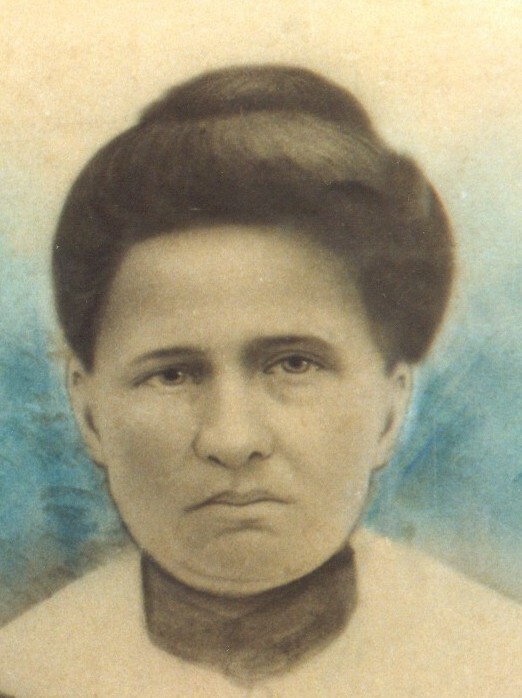 She married Frank Hadden, son of Hugh Hadden and Lucy Sapp, on 23 December 1875 at Madison, Florida, United States.2 Temperance died on 25 April 1942 at Madison, Florida, United States, at age 88.3 Her body was buried on 26 April 1942 at Pine Grove Church Cemetery, Madison, Florida, United States. 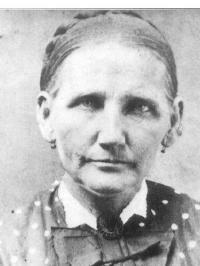 Temperance or Tempie as she was called was a lifelong resident of Madison County. Temperance very likely was named after her mother's sister, Temperance Townsend. She was the second child and only daughter of James Joseph Caulk and Mary Ann Townsend. She had six brothers. She was married to her husband, Frank, by the Rev. E. S. Tiner in the home of her father just before Christmas, 1875. She died in 1942 at age 88 at the home of her son, Thomas, near Pinetta, Madison County Florida. She is buried next to her husband in Pine Grove Church Cemetery, Madison County, Florida. Her parents and many of her children are also buried there. [S11] Florida State Vital Records, Cert. of Death for Mrs. Tempie Anne Hadden, File 7734. Hattie was born on 27 October 1876 at Madison, Florida, United States.1 She was the daughter of Frank Hadden and Temperance Ann Caulk. She married Samuel Tilden Webb, son of John Traveler Webb and Sarah Elizabeth Bailey, on 12 December 1900 at Madison, Florida, United States.2 Hattie died on 13 August 1932 at age 55.3 Her body was buried in August 1932 at Corinth Baptist Church, Madison, Florida, United States. [S68] Madison Co. Florida Marriage Records, Book 2, page 144. [S710] From gravestone 31 Mar 1989. Annie was born on 23 March 1883 at Madison, Florida, United States. She was the daughter of Frank Hadden and Temperance Ann Caulk. She married Wilbur Watson Gramling, on 18 November 1913 at Madison, Florida, United States.1,2 Annie died on 19 November 1916 at Madison, Florida, United States, at age 33. Her body was buried at Pine Grove Church Cemetery, Madison, Florida, United States. Annie America Hadden died in childbirth as did the baby and they were both buried in one coffin in Pine Grove Cemetery..
[S68] Madison Co. Florida Marriage Records, Book 3, Pg. 483. [S29] 1910 Census Madison FL, E.D. 94, Family 142. [S167] Jack Ragan, Ragan and Ragans, p. 24. [S68] Madison Co. Florida Marriage Records, Book 3, Pg. 55. [S110] Joseph T. Eichelberger, Madison County Florida Cemeteries, p. 68. George Taylor Scott was undoubtedly named after his grandfathers, George Wiley Kelly and Taylor Scott. George Wiley Kelly in turn was undoubtedly named after his grandfather George Wiley, R. S.
George Taylor Scott's death certificate indicates that he was born in Dawson, Terrell Co. Georgia and that is how we have his place of birth recorded. The informant on the death certificate is his granddaughter Susan Scott Mixson. However, George's parents (and two sisters) were living in Calhoun County, Georgia in 1860 before his birth in 1867. By 1870, George, his parents and three sisters are all living in Colquitt, Miller Co., Georgia. It is thus very likely that George Taylor Scott was born in Miller Co. or even Calhoun County rather than Terrell Co. Georgia. Perhaps the family moved back to Terrell County in 1867 when George was born. George's father Sam Scott died in 1877 in Miller County and by 1880 George and his widowed mother, Rebecca Kelly and four sister's (Ella, Rebecca, Rachel, and Mattie) are all to be found living in the household of George's grandfather, George W. Kelly in Terrell County, Georgia. It appears that after the death of Sam Scott, Rebecca returned to Terrell County to live with her parents. 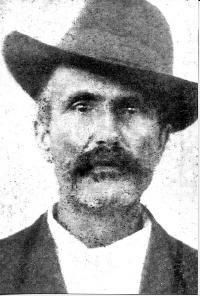 George next appears in Taylor County, Florida in July 1892 where he marries Willie E. Humphreys. No further information is available on Willie E. Humphreys. It is not clear what brought George to Florida from Georgia. However, his Uncles, John R. Kelly and Charles R. Kelly were well established in Taylor County as early as the 1870's. It is likely George saw opportunities in Taylor County and moved near his Uncles. On 23 December 1894 George married Ella Frances Jackson, daughter of Richard Ford Jackson and Mary Jane Donaldson., both deceased at the time. George and Ella started to raise their family in the Spring Warrior / New Hope Church area south of Perry, Florida. On 17 August 1903 George applied for 80 acres of land in the Spring Warrior area from the General Land Office at Gainesville, Florida. On 5 November 1906 George received his patent for the land from President Roosevelt. That land is described as the SE Quarter of NW Quarter and SW Quarter of the NE Quarter of Section 27, Township 5 South, Range 8 East. This land is 400 yards due east of Spring Warrior Church Cemetery where Ella's father, Ford Jackson is buried. This land is now a pine tree forest, owned by timber interests. George and Ella are buried next to each other in New Hope Cemetery about 1 mile south of this land. [S710] The gravestone and Certificate of Death for George Taylor Scott show his date of birth as 21 Sep 1865. A review of the 1880 Census of Terrell County Georgia, the 1900 and 1910 Census of Taylor County Florida for George Taylor Scott show he was born in 1867. I thus used the 1867 date from those census records. [S27] Taylor Co. FL Marriage Records, Book 1891-1903, p. 61. [S27] Taylor Co. FL Marriage Records, Book 1891-1903, p. 140. [S11] Florida State Vital Records, Cert. of Death for George Taylor Scott, File No. 20573. [S710] Visited by writer 22 Apr 1981. [S31] 1850 Census Madison FL, Pg 171, Dwelling 112, Family 112, 12 Oct 1850. [S21] Charles Franklin Hadden Family Bible. [S710] Grave is unmarked and on the north side of her husband, George T. Scott. Charles was born on 1 September 1897 at Taylor, Florida, United States. He was the son of George Taylor Scott and Ella Frances Jackson. Charles died on 15 September 1898 at Taylor, Florida, United States, at age 1.1 His body was buried in September 1898 at New Hope Cemetery, Taylor, Florida, United States. Jessie was born on 24 October 1898 at Taylor, Florida, United States. She was the daughter of George Taylor Scott and Ella Frances Jackson. Jessie died on 3 November 1902 at Taylor, Florida, United States, at age 4.1 Her body was buried in November 1902 at New Hope Cemetery, Taylor, Florida, United States. James was born on 19 November 1900 at Taylor, Florida, United States. He was the son of George Taylor Scott and Ella Frances Jackson. He married Ruby Sims, circa 1915.2 James died circa 1959. [S566] John B. West, "Scott Family Records."